Can’t tell a Clio from a Captur, or a Zoe from a Twizy? Don’t worry, we’ve got everything you need to know about Renault and its cars. 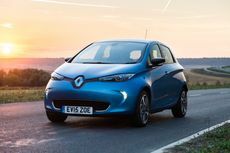 Renault shows off the fastest and most powerful Zoe yet, as the supermini gets a new electric motor for 2018. It's time for Phill to say goodbye to his long-termer Renault Clio. It's been a good little car overall, but he can't get past some of its little quirks. Phill asks his colleagues what they think of his Clio, as he tries to ignore its irritating quirks. After a few months in the Clio, Phill is finding there are a few minor irritations, which are spoiling his enjoyment of what is basically a decent little car. In our Classic Ads series, we take a look back at some of the motoring industry's most infamous, memorable, and controversial adverts from years gone by. First up, the seven-year epic that was Nicole and Papa. In our Classic Ads series, we take a look back at some of the motoring industry's most infamous, memorable, and controversial adverts from years gone by. Who remembers Renault's search for a little Va Va Voom? Renault’s second Koleos heads upmarket, and while it takes aim at more premium SUVs, buyers will probably see it as an alternative to the Skoda Kodiaq and Kia Sorento. The company's first hybrid combines a diesel engine and an electric motor, bringing modest improvements in fuel economy and slightly lower CO2 emissions.